Taman Negara National Park, Malaysia premier National Park, covers 4343 square kilometers covering Pahang, Kelantan and Terengganu state is 130 million years old, the oldest rain forest in the world. The highest mountain in the Peninsular, Gunung Tahan, 2186 meters stands in the park. Covered with primary jungle and scattered limestone outcrop, it is truly the outdoor destination for the holidaymakers. Taman Negara (formerly known as king George V National Park), more than 130 millions years of age, beckons the adventurous to a mysterious world older than the Congo or the Amazon. Taman Negara, located at the very heart of Pahang's tropical forest, which has lain mostly undisturbed for millennia, maintains a natural habitat for a variety of flora and fauna, some of which can only be found in this part of the world. Trees that are hundreds of years old form a giant canopy above you as you enter into Taman Negara, which is accessible through Jerantut, the main entry point. Access is by boat and quite recently, there is a paved road all the way to the base camp at Kuala Tahan. For the lucky travelers by boat, watch out for the Smooth Otters or Small Clawed Otters. Spot the three species of kingfisher and hear the calls of the white Handed Gibbons, the Great Argus Peasant and the shrill call of the Cicadas. When you are in Taman Negara, visit the numerous caves around the park. The favorite being Gua Telinga or Ear Cave. Home of thousands of Round Leaf Bats, Giant Toads, Whip Spiders and Cave Racer Snakes. 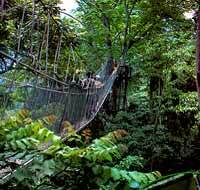 The longest Canopy Walkway in the world, spanning 460 meters long and 40 meters off the ground is not to be missed. For birds watchers, bring along your field book and binoculars and spot the Greater Racquet Tail Drongo, Southern Oied Hornbill, various Spiders Hunters, Sunbirds, Broadbills, Malkohas, Peasants and many more. Listen to the "orchestra" in the early morning. Other activities includes spending the night in the Hide, Fishing, Rapids Shooting or visit the Cascades. A visit to Taman Negara is a journey to be at one with nature with wild animals roaming the forests, crystal clear stream, spectacular rock formations, green lush vegetation and a variety of wild flowers that will take your breath away. The nearest international airport is the Kuala Lumpur International Airport. Airport taxis can either take you directly to Kuala Tahan Village or you may opt to go to Kuala Lumpur city and join daily shuttles to Taman Negara. From Singapore, a night train (also fondly known as The Jungle Train) brings you right to Tembeling Halt, and from here you can walk to the jetty, which is only half an hour away. From the Tembeling Jetty, the Park's Headquarters at Kuala Tahan, is a 2½ or 3½ hour boat ride up the Tembeling River. This boat ride costs between RM38 per person return trip. Reputed to be the longest canopy walk in the world. Opens late morning and not to be missed. Excellent views of the Park from above the trees. From here one can climb 200m above sea level to View Point which is a vantage point overlooking Taman Negara. One of the most beautiful rivers in Taman Negara with trees growing over thousands of years creating a canopy of leaves as you cruise below. The river here is protected as a sanctuary for "Kelah Fish". Further upstream is Lata Berkoh, a little lagoon excellent for swimming and picnics. The Orang Asli (Native People) in Taman Negara are known as Bateks. They lead a nomadic life where they stay in one area for weeks or months and then move to another area. In each area they cultivate tapioca and grow vegetables. The harvests from the jungle and river is an important lifeline to their survival. There is no other way better than jungle trekking to appreciate the wonders of the rainforests. There are marked trails, camps and hides made available for the adventurous and trained nature guides supervised by the Wildlife Department are also available for longer treks up to 5 nights. There are two train services in Malaysia very interesting for tourists: The "Eastern Oriental Express" and the "Jungletrain"
The Jungle train is more basic. You can choose a hard seater or a soft seater, there are air-conditioned compartments and there are non air-conditioned compartments. In the last you will meet the local people, traveling to another kampong or there are girls/boys going to school. The Eastern and Oriental Express has a lot of luxury. The train is going from Singapore to Bangkok and stops in every interesting city's along the railroad (Malacca, Kuala Lumpur, Butterworth (Penang)). In these places the train will stop for some hours, so that the passengers can make an excursion. This train is expensive: 1500 US or Euro. The jungle train is traveling through the jungle from Gemas to Tumpat, which is near Kota Bahru (10 km). If you want to make that trip, you have to do South to Gemas. Plenty of taxi's will be waiting for you to bring you to the nearest station. The train will leave at 13.00 hours, so you don't have to hurry. The passage to Tumpat will take 8 hours. Late in the evening you'll arrive in Tumpat. From the little towns Jerantut or Mela the train will go North and you will be traveling through the thick jungle. The train will stop at a kampong to let passengers in and out. Until Gua Musang you will see nothing but jungle and sometimes a kampong. Near Gua Musang you get more view of the landscape. The green jungle is behind and you will see more rice fields. There's a day train and a night train on the track from Gemas to Tumpat. The day train is stopping more often then the night train. It's obvious, that the day train does the track in shorter time, because less people are getting of the train. Taman Negara is a 15-acre forest sanctuary. As one of the oldest tropical rainforests in the world, the possibilities for eco-tourism are immense. Here, visitors find endless evological adventure and opportunity to observe diverse species of animal and plant life. Canopy walkway - The world's longest suspension bridge 50 meters above ground and stretching over 530 meters, it's an opportunity to see the various plants and animals that inhabit the topmost layer of the forest. Jungle trekking and hiking - There are trails varying from an hours' walk to serious trekking lasting up to nine days. Pre-trek preparation is imperative and a guide must accompany guests on long treks. Mountain climbing - The more adventurous can try climbing Gunung Tahan, the highest peak in Peninsular Malaysia. This challenge demands will power, physical fitness, good equipment and a guide. The trail is 55km from MUTIARA Taman Negara. Wildlife observation hide (Jungle hide) - Spend nights hidden up in the trees while waiting for a tapir, bear or elephant to appear. Most hides are built overlooking saltlicks, from which some animals obtain necessary minerals. Except for Bumbun Tahan, which is five minutes away, most require either a boat ride or a few hours walk to get to it. Orang Asli Settlements - "Orang Asli", the local natives, are gentle folk who lead a nomadic lifestyle in Taman Negara. They are called Batek and their settlements are found along the trails whilst, some are accessible by boat. Cave Exploration - The Gua Telinga (Ear Cave) has an ear-like rock formation, while Gua Daun Menari (Dancing Leaves Cave) and Gua Kepayang are limestone outcroppings. Gua Telinga is 2.6km from Mutiara Taman Negara, while Gua Kepayang and Gua Daun Menari are located 17.7km and 20.9km, respectively, from the resort. Fishing - One of the main attractions of Taman Negara, it is best carried out during the drier months of February to April and June to August. Anglers will need permits, which are issued at RM10 per rod. Shooting the Rapids - Experience an exhilarating ride upstream on Sungai Tembeling. Prepare to get drenched as the boat negotiates seven sets of rapids along the 45-minute journey. Bukit Teresek - Hike up this 334-meter hill and enjoy breathtaking panoramic views of Gunung Tahan and the forest canopies that cover the hills and verdant valleys below. Located 1.7km away from the resort, it can be reached in 45 minutes. Lata Berkoh - A spectacular cascade with a deep pool below it and a rocky area overlooking the rapids. Located 8km from MUTIARA Taman Negara, it is an ideal spot for a picnic. See Taman Negara from the longest canopy walkway in the world (550m), suspended 40 metres above ground. Explore the unspoilt limestone forest comprising some of the most beautiful caves such as Gua Peningat, Gua Telinga, Gua Daun Menari and Gua Besar. A boat trip up Sungai Tembeling from Kuala Tahan is one of the most exciting activities, encountering numerous rapids. 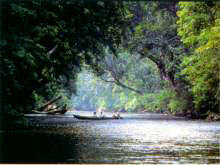 Check out the cool fishing spots at Sungai Keniam. Camp out or stay overnight at Kuala Perkai fishing lodge. The highest peak in Peninsular Malaysia takes at least 7days to scale, conquering its steep slopes and tricky rivers. Visit the Orang Asli or Aboriginal village to learn more about their culture and way of life. Experience the thrills of the currents at Sungai Tembeling. © 2006 DiscoveryMice for APECO2006. All Rights Reserved.Discovery Trovery Travel Channel. All Rights Reserved.